Steven Universe is a show about "fantasy's love affair with reality"
Rebecca Sugar was a crucial ingredient in Adventure Time, as an artist, writer and songwriter. And tonight sees the debut of her show Steven Universe, in which a little boy lives with a group of superpowered women. We talked to Sugar about why this show turns the usual relationship between fantasy and reality on its head. "I've always been really interested in fantasy and escapism. I wanted to see if I could make it a show that sort of reversed the convention of escapism," says Sugar. In particular, she wanted to explore the idea of "fantasy characters being fascinated by regular people." 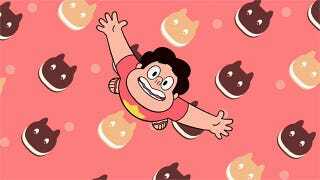 In particular, the show is about "fantasy having this love affair with reality," and Steven himself is the product of that love affair, says Sugar. "He's a manifestation of that. He is the thesis of the show, [because] he is both [fantastical and real] at the same time, and everyone is fascinated by him." The nature of the Crystal Gems, the team of heroes that Steven lives with, is "something we explore in the show." They're not human, exactly, and they sort of represent this ideal of perfection that Sugar feels like "entertainment makes us feel exists, that doesn't really exist." And throughout the show, we keep watching these impossibly perfect magical characters encounter reality and get pulled into it. As the show begins, we meet the Crystal Gems already having had some experiences that formed their identities, and "they've let themselves become interesting people," says Sugar. "They've found these identities by being on Earth and being with Steven. They've become really specific people, that maybe they weren't before." We slowly learn about the things on Earth that have shaped the three Crystal Gems. Sugar says that Steven Universe was originally inspired by her younger brother. "The main character is based off of him." She wanted it to "come from a personal place," and be fun and accessible and funny, as it became a cartoon — while at the same time not being afraid of "letting it be a cartoon." She wants it to be true to her personal experience, and the experiences of the people working on the show. But once you start making something as a cartoon show, you're inevitably collaborating with a ton of other people — and on Steven Universe, just like Adventure Time, the show is basically written by the storyboard artists, although there are two "writers" on the show who are also experienced artists, says Sugar. Steven learning to use his own superpowers, which come from the gem in his stomach, is the main arc of the show, says Sugar. There are a few aspects to this — there's the magical aspect of this journey, but also what it means emotionally for Steven to become a hero. Steven is half-human, and thus "he's something new," says Sugar. The Crystal Gems have never seen anything like him before. And learning to use his power is something that takes a long time and always a struggle for Steven — and the way he chooses to use his gem is very specific to him. Each of the Crystal Gems feels differently about Steven, and whether he'll be able to use his gem — but it's not as if he'll be kicked out of their house if he can't harness the power. "They would be fine with him not being able to," says Sugar. The show slowly evolved as Sugar kept talking to the studio about it, and "I was lucky that they were open to having a layer of depth under the surface of the show. That is something that I cared a lot about." Within the show, we really try to treat all the characters as though they're real, and their relationship to Steven is very complicated. Exploring that is really interesting for me — but then when you see from Steven's perspective, it's always really simple, because he's watching these other characters dealing with things he can't understand. And we find ourselves almost writing two shows: the show about them and what they're going through, and then the show about him and what he's experiencing. That's sort of the two different layers of the show: [the other characters] and Steven. If you want to watch it as a fun show, you can really only watch it as Steven's show. There are tons of mysteries and deep layers of mythos on Steven Universe — and because it's told from Steven's point of view, there's a ton that he doesn't know. He'll learn stuff as the audience does. But the central mystery of the show revolves around what, exactly, Steven is — and what the Crystal Gems are. "There is a reason for everything," says Sugar, "but it's something that he doesn't know at the moment." Just like Sugar's episodes of Adventure Time, Steven Universe features some insanely catchy songs. The first two episodes have a rap song about cat-shaped ice creams, and the pop jingle "Let Me Drive My Van Into Your Heart." Sugar wrote the latter, but the former was written by the show's writers. "I have people that are doing what I did on Adventure Time on my show," and everybody is writing songs. "I try not to put a song into anything that I don't really believe is good, so I space them out," says Sugar. "I try not to rush them. And I try to make them different... I have my chords that I love, which are basically the chords in the [Steven Universe] theme song, [but] I try to branch it out." She says she puts a lot of pressure on herself "to get better and not plateau in my songwriting style." Sugar had a huge role in helping to develop the backstory of Ice King on Adventure Time, but she says that was definitely a team effort. "Everybody loves Ice King," she says. Jesse Moynihan used to talk about how he saw him as a Rumpelstiltskin type... Everybody had a different take on him. I didn't really relate to him as much as my storyboard partner Cole Sanchez. Which it was so fun to do the Marceline-Ice King episodes, because I really related to Marceline and Cole really related to Ice King." But "a lot of the credit for humanizing Ice King should go to Pat McHale, who came up with the idea of having him be Simon Petrikov in 'Holly Jolly Secrets.' And from there, everything grew out of that. But we won't necessarily see that many iconic villains on Steven Universe, says Sugar — the Gems aren't dealing with a particular person, but something "bigger than that." There's not "really a singular enemy." Instead, the conflict will be within the group, and it'll be about Steven figuring out what's right.